The second bout of the Newcastle Roller Girls hosted Nevermind The Backblocks, saw the home team Canny Belters face off against the Lincolnshire Bombers Bombshell Bruisers, and a mouth-wateringly physical battle was definitely on the cards. Both teams are known for having their fair share of nippy, often ridiculously quick skaters, but both are definitely also recognised as having some fearsome hitters in their ranks as well. These two teams are also noted for having extremely well-drilled rosters. In short, we were about to be treated to an exciting afternoon of hard-hitting, fast paced and quite possibly close-to-call roller derby. Therefore, it was no surprise to note that the first period opened with a series of low scoring jams, with each team feeling each other out, more than blitzing the scoreboard. The efforts of Von Sleaze, Brie Larceny and Kalamity James racked up 11 points over the first nine jams, with Diss-Continued, Catfight Candy and Florence The Machine grabbing 20 altogether for the Bombshells. Constant battles from the blockers on either team, especially the likes of Gin +Sonic, Big Smack & Fries and Kelly Kaos ensured that the start would be a low scoring one. The bout kicked into life a little more in the tenth jam, with the scores at 11-20. With Synyster Motives starting the jam in the bin, Von Sleaze took advantage of the outnumbered Lincolnshire blockers to grab lead jammer ahead of Catfight Candy. Her task was further aided by Catfight being sent off early in the jam, swiftly followed by Jewel N Armour. The efficient outside lining from NRG proved critical here, as Lincolnshire were simply unable to cope with Von Sleaze’s power jam, which boosted the home team score by 16 points, with no reply from the visitors. The Belters continued to shut out their opponents completely for a further four jams as they impressed a dominance on the bout. The Bombshells were first frustrated in the eleventh jam, as Miss Wired withstood a huge hit from Mills, adding 5 more points to their total. This was immediately followed by Kalamity soaking up hits from each of the Bombshell blockers, but simply refusing to be stopped picking up 7 more points, and eventually being helped out by Missy Pow Pow knocking jammer Diss-Continued to the back of the pack. The hard work was continued by Bettie Basher in the thirteenth jam, slipping beyond the reach of Karen to take lead and bump up a further 4 points; 43-20. Once NRG hit 45 points, it was the turn of the visitors to prevent extra scoring, as they frustrated their hosts for four jams. With Diss-Continued picking up their first 4 points in a while in the fifteenth jam, and Florence The Machine with 2 more in the seventeenth, Lincolnshire aimed to truly close the gap in the eighteenth jam. With NRG jammer Bettie Basher being sent to the bin early on, Diss-Continued took lead status and brilliantly – not to mention barely – squeezed past Missy Pow Pow, before making a series of impressive passes. The efforts of the jammer were finally brought to an end by the seriously sturdy wall work from blockers Gin + Sonic and Big Smack, preventing any more than 11 points being conceded; 45-37. The response was immediate from the Belters, who again made the most of a power jam. With Catfight Candy being sent off immediately, Von Sleaze was free to raid a stubborn Lincolnshire wall. A serious battle between the respective blockers culminated in Bucks Liz and Kelly Kaos being sent to the bin. Von Sleaze took advantage of the lacking numbers hand-in-hand with the power jam, to bring 14 points to the home team. The total was bumped up even more in the following jam, as Kalamity was also facing a team without jammer and a blocker, pulling in 7 points, with the help of Bettie Basher slamming Catfight Candy and Kissy out of the way for her; 66-41. A period of three more jams passed where the home side picked up only a single point, whilst Florence The Machine scored 4 more for the visitors. But this was not to be a boring end for a first period. With the twenty-fourth jam came a release of attacking prowess from both teams. As Bucks Liz, Gin and Jo starting the jam in the bin, both jammers Kalamity and Catfight Candy fought their way through the pack, only for neither to get lead status. Kathital Punishment was sent to the bin in her attempts to keep Kalamity at bay, whereas Bear managed to keep Catfight at the back of the pack after an initial burst. A series of extremely physical collisions on Kalamity while jamming, still couldn’t keep her down, providing a rip-roaring conclusion to the first half. Like the first half, the second period began in a slightly cagey, low scoring affair. In fact, the only points of the first three jams were picked up in the opening session, as Diss-Continued added 6 to the total, before being taken out by Missy Pow Pow. However, these would be the only points the Bombshells would get for five more jams, whilst the home team added a steady 5 to their tally, due to the jamming of Miss Wired and Kalamity. Lincolnshire reminded NRG of their danger in the eighth jam, preventing any further points from Miss Wired, whilst Florence The Machine somehow found a way past Brie Larceny and Gin + Sonic, picked up 7 points and was eventually stopped by Bucks Liz on a final pass; 83-67. But again the home side looked to push their dominance forward in the ninth jam. The Belters blockers stepped up to the mark to deny Synyster Motives access through the pack. A particularly spectacular block on Kissy wiped the Bombshell blocker out of the path of NRG jammer Von Sleaze, who would continue to rack up the points as the Lincolnshire wall simply could not cope with her. A very good jam for Newcastle; 105-67. The following two jams, however, only brought 4 more points for the side, while the visitors managed only 8 of their own. The twelfth jam brought something of a comeback for Lincolnshire, and a warning message for the Belters. Kelly Kaos attacked the jamming position with vitriol for her team, being slowed at first by Brie Larceny and Gin + Sonic, but finding a way through once the former and jammer Von Sleaze were sent to the bins. The power jam was truly utilised to full capacity by Kelly Kaos here, dodging her way through the pack to gain an impressive 18 points for the Bombshells, though she was sent off just as the final of the whistles were being blown; 109-93. A response was immediate from the Belters, who were handed a power jam situation thanks to the send off of Kelly Kaos in the previous jam. Miss Wired burst her way through the pack instantly, helped by Big Smack & Fries distracting the Lincolnshire blockers. 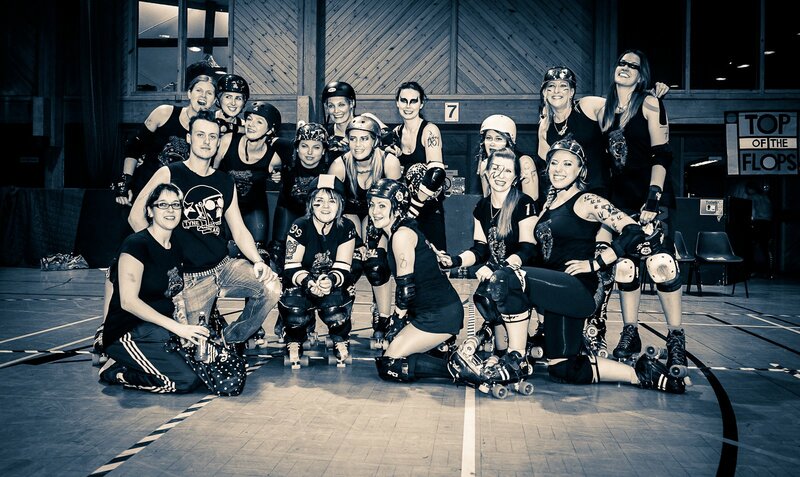 The Newcastle jammer proceeded to weave her way through the pack for a further 15 points. However, the fight was certainly not out of the Bombshells yet, as they responded in the very next jam. Kalamity took an early lead status, grabbed 5 points, but was then sent to the bin, releasing Kelly Kaos. Brie Larceny and Anita B. Nasty were both sent to the bins for their attempts to stop the Bombshells jammer, who did very well to skirt through the pack. Kelly Kaos was only prevented from causing serious damage by great work from Gin + Sonic and Elasta Plasta; 129-110. The next six jams saw tension creep into the bout, with both teams aware that time was slipping away for any major point scoring. With the points at 138-117 and only three minutes left on the clock, the Canny Belters knew they had to secure a result in the final throws, and so, like the bout before them, the penultimate jam of the game was an exciting one. Catfight Candy did extremely well to break beyond Kalamity, but was sent to the bin after picking up 5 points for an over-zealous back block on Brie Larceny. Von Sleaze took advantage of the power jam yet again in surviving a big block from Kathital Punishment to add 8 points of her own with just over one minute to go. The blocks were flying in from all directions, with Catfight Candy sent off again, followed by Jo; however, a key moment came when Von Sleaze was also sent off, but a clever piece of play by the jammer meant that she prevented the reinstating of Catfight until the jam had already ended; 146-122. The twenty-second and final jam of the bout was a short-lived but exciting affair in itself. With Catfight having to settle for a place in the bins alongside blocker Jo, Von Sleaze was able to dance through the pack to take lead and call the jam, and the bout off just as her opposite number returned to the track. An extremely physical and exciting effort from both teams, and a showing of sheer determination once more from the Belters to overcome some seriously tough opposition. 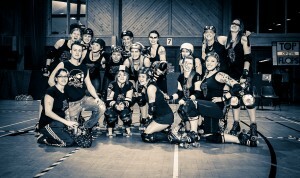 Previous PostWhippin’ Hinnies breach the DamebustersNext PostRollympic Games tickets on sale now!